The LB series standard gain horn antennas are linearly polarized and provide an efficient low cost means of making measurements. 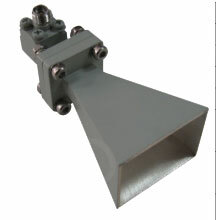 Mo-Tech's standard gain horn antenna can cover from 320MHz to 220GHz frequency range. These horns are ideally suited for EMI testing, direction finding, surveillance, antenna gain and pattern measurements and other applications.